Many Mechanical Engineering-Engineering Mechanics (MEEM) students go into automotive, manufacturing or medical device industries, but Alex Weber, double major MEEM and Theatre and Entertainment Technology, is blazing her own trail. Picture this: you master the art of the backstage and land your dream job in the entertainment industry at a leading company, like Disney or Electronic Theatre Controls. 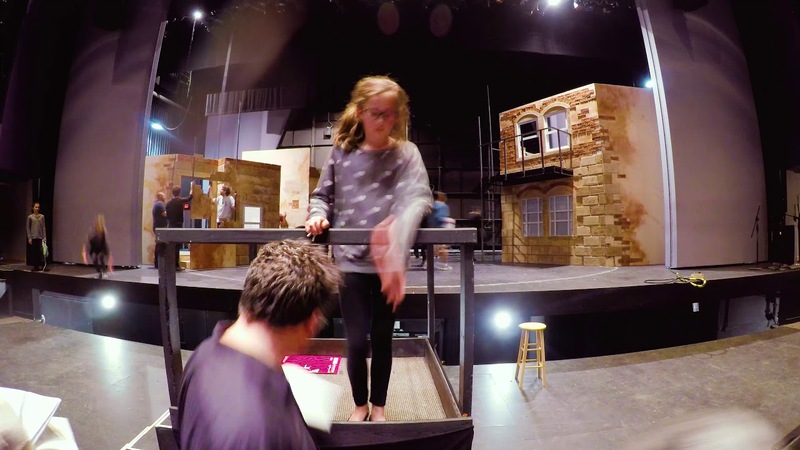 At Michigan Tech, you can make this vision a reality with a Bachelor of Science in Theatre and Entertainment Technology (SFET). With the integration of studies in art and design with engineering technology or business, you will become a well-educated professional who blends solid technical expertise with innovation, artistry, and creativity. Stage set up timelapse by Rozsa Center for Performing Arts staff and Michigan Technological University students. The performance, West Side Story, changed the very nature of American Musical Theatre. With music by Leonard Bernstein and lyrics by a young Stephen Sondheim, the play was grounded in a distinctively modern sound with a passionately poetic statement: A place where everyone can grow beyond the confines of hate and poverty, a safe and beautiful place, a place for us. Presented by The Michigan Tech Theatre Company in spring 2017. If you have ever imagined yourself behind the scenes of a theater or entertainment production—perfecting scenery, lighting, costumes, makeup, sound, and management—the Department of Visual and Performing Arts is the place for you. What Kinds of Projects Will I Do in School? Research and design costume, lighting, or scenic design for mainstage productions. Assist faculty members in workshop preparations, with the potential to work on faculty grants. Take significant courses in design, technology, and possibly computing to learn to adapt your training to non-theatrical entertainment career fields. How does Michigan Tech help me start my career? A professional portfolio: You will begin creating a portfolio during your first semester, continuing to develop it so that you leave campus with a solid professional presentation of yourself. One-on-one academic advising: You will meet with your advisor each semester to talk about your progress and class schedule, keeping you on track to graduate. These meetings will also shape your production experiences at Tech. Career advising: Your advisor will also discuss career options and post-graduation goals with you, and will assist you in searching and applying for internships—skills that are applicable to post-graduation job searching. Networking: You will regularly attend professional conferences, where you will meet with industry professionals and, as an upperclassman, present your work. As a graduate of the theatre and entertainment technology program, you will be qualified to fill entry-level backstage positions in the entertainment industry. Start your career as an assistant designer or a crew member of a theatre house, theatrical touring company, a Las Vegas-style show, or a theme-park or cruise-ship production. You may work in theatrical productions or at multimedia concerts, theme parks, elaborate corporate events, half-time extravaganzas at sporting events, and more. You may spend a year in a post-graduate professional internship. gain foundational analytical skills to be able to recognize and interpret quality works of design and technical theatre and entertainment. understand and apply complex methods of expression. approach important questions pertaining to performance works of theatre and entertainment in a focused and methodical way. understand the foundational elements and principles of design in structure through various artistic forms relevant to their chosen disciplines. demonstrate foundational skills and techniques within design, technology, and management. present the body of their technical and performance work in an organized and artistic manner. demonstrate the ability to modify their work after self-evaluation and external review. understand the history and evolution of theatre and entertainment design, technology, and management. demonstrate a familiarity with major artistic works throughout history. independently evaluate and understand a performance work in its artistic, cultural and historical context. research, interpret, and apply historical artistic theatrical or entertainment forms and methodologies to their own artistic practice. understand the scientific foundations relevant to theatre and entertainment design, technology, and/or management. apply principles of the scientific method as a tool in solving artistic and technical challenges in theatre and entertainment. demonstrate a working knowledge of current technology that supports work in their chosen emphasis areas. demonstrate a technical flexibility to accommodate the use of new and emerging technologies related to theatre and entertainment. familiarize themselves with the diverse theatre and entertainment industries. understand basic structures and organization in the entertainment industry. demonstrate professional skills in their theatre and entertainment industry-specific areas of study. converse and write using the diverse modes of theatre and entertainment industry standard communication. join important industry-related organizations and participate in meetings of those organizations. evaluate their work within the context of the work of peers and professionals in their chosen emphasis areas in the field.